I’ve been meaning to snap a photo of this for ages. 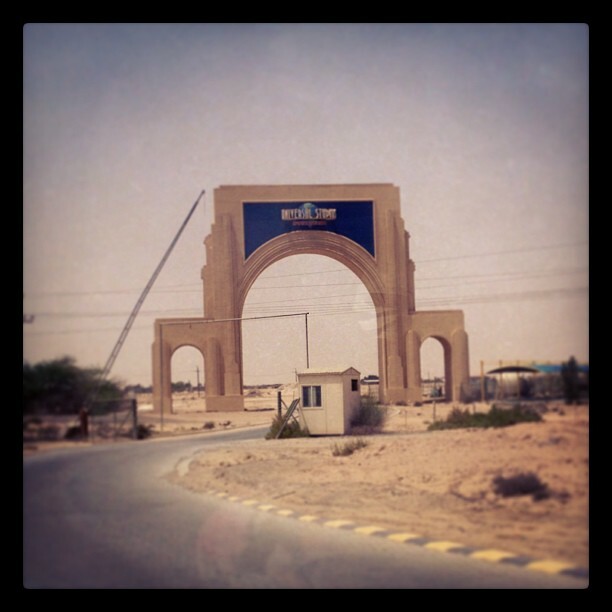 Dubai’s Universal Studios gate to nowhere. A while back, a Universal Studios theme park was supposed to be constructed in the Dubailand section of Dubai. As you can see, it never happened, nor is it ever going to. Not in that location, anyway. This gateway to nothing, which was clearly meant to lead to something awesome, has always struck me as a bit eerie and comical. I like that after all these years, it still stands for no real reason. Apparently there are new plans to have another go at a Universal Studios park in the upcoming Mohammed Bin Rashid City here in Dubai. I’m curious to see if they’ll jump the gun and put in another monolithic entrance gate before anything else. I know! I’ve been here a lil over 5 years now, and there’s always something still surprising me. I don’t remember when I first noticed the Universal Studios gate, but I have the feeling it’s here for the long run!